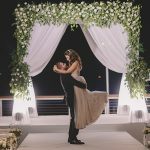 Aliza, the Bride: Both our wedding and reception took place at Riverside in in central Tel Aviv’s beautiful Hayarkon Park. 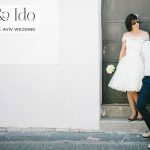 We had a few considerations — we knew we wanted to get married in Tel Aviv since Ron is originally from the area, and our American guests would certainly welcome a Tel Aviv vacation over a USA holiday weekend. We also had to shield our guests from the potentially chilly (and potentially rainy!) 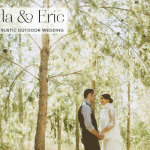 Israeli winter, and we also wanted an intimate venue for our small (by Israeli standards!) number of guests. After seeing several venues with our wedding planner, we knew Riverside was the one within a minute of walking in. 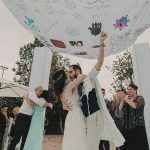 For winter weddings, the space is fully enclosed with floor-to-ceiling glass, so our wedding would enjoy a beautiful park / Tel Aviv view with the shelter and warmth of an indoor venue. 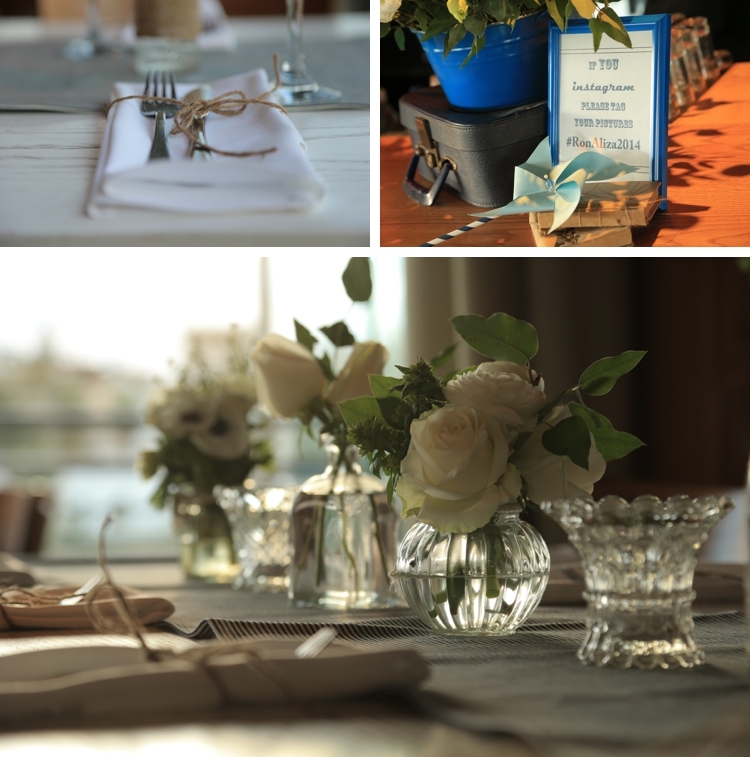 We took advantage of the river locale and the water-themed details of the space and went with an elegant nautical theme using lots of blue and white with green accents. We wanted the theme to be elegant but not fussy so with the tables being a beautiful blonde wood, we kept them almost bare with just a seersucker runner down each one. 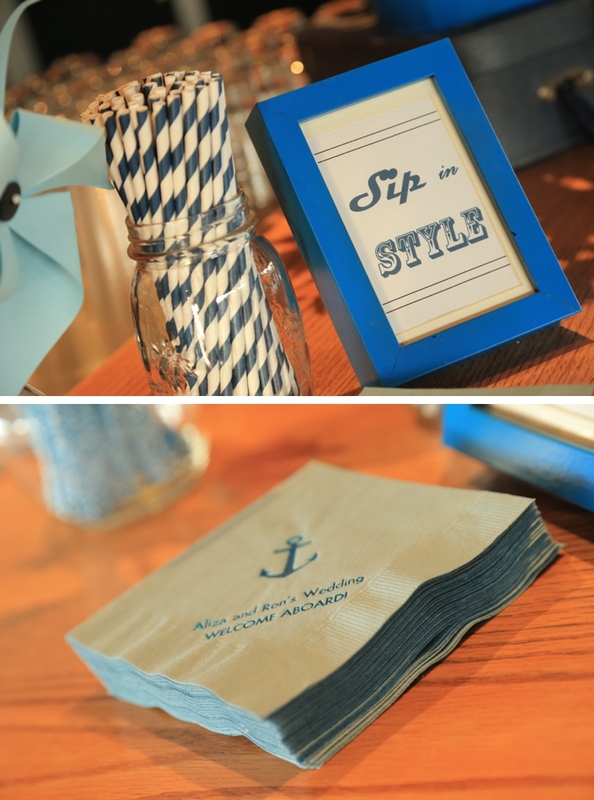 Each table number was held by a nautical knot and the guest’s napkins tied with twine. 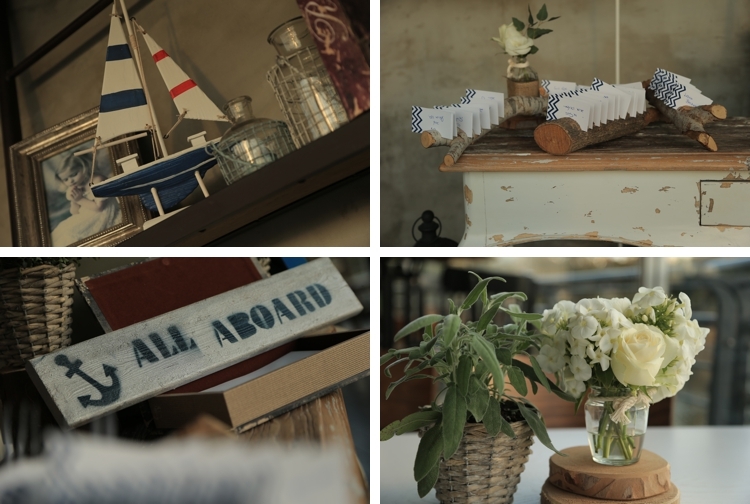 Lots of candles, small floral arrangement were placed on each table, vintage suitcase, wooden lighthouses and signs (especially made for the event), driftwood like wood held our placement arrangements and wooden whitewash lanterns. We also had life savers in the bathrooms, sea scented candles, pinwheels and striped navy blue straws. These touches made it all so special! Since we had both Israeli and American guests, we had two versions of the invitation, one in Hebrew and one in English. 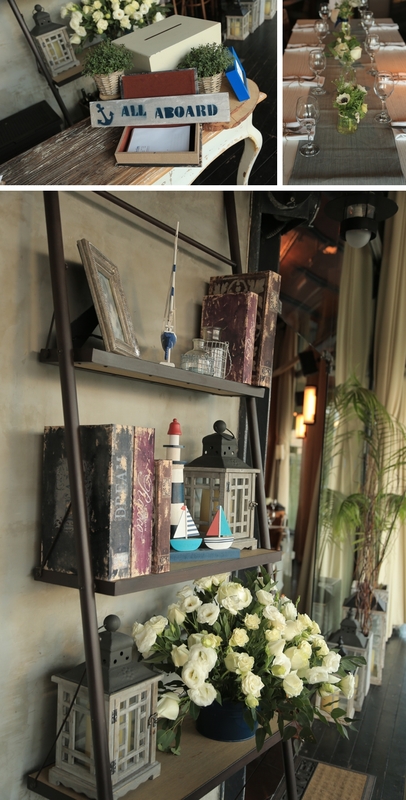 Ron’s brother Gil designed the israeli invitation, which was playfully nautical. For the English speakers, the invitation was an elegant letterpress with engraved chevron (nautical ”hint”) details, pressed by Designers Fine Press. I found my Madeline Gardner dress in a lovely boutique in Brooklyn. 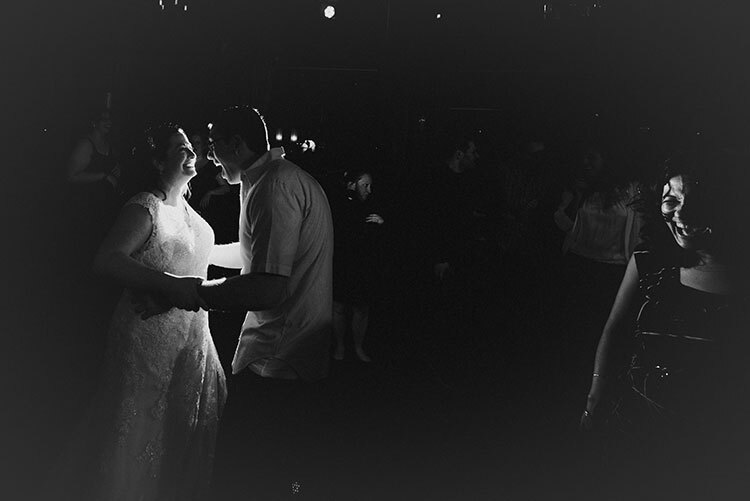 The dress was organza with a lace overlay, A-line and cap sleeved… the dress of my dreams! 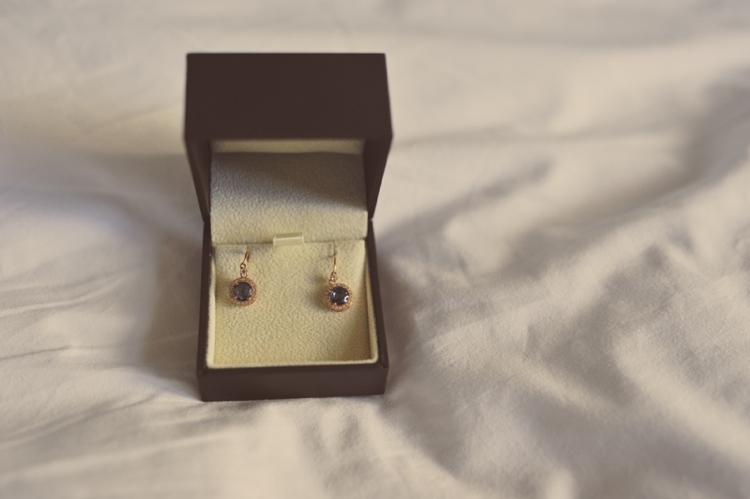 Ron surprised me with beautiful rose gold and London blue topaz and diamond earrings by Suzanne Kalan. They were my fabulous “something blue” for the day. I had a special barrette custom made in a boutique called Bridal Veil Falls in New York City’s East Village. The owner is very talented and created a piece with sparkle that also contained rose gold, to match my earrings. It was the perfect accessory to sweep half my hair back. When it came to my shoes, I was looking to be comfortable above all, but cute in case they poked out from under my gown! I went with a sparkly ballet flat by Pretty Ballerinas and was able to dance all night! 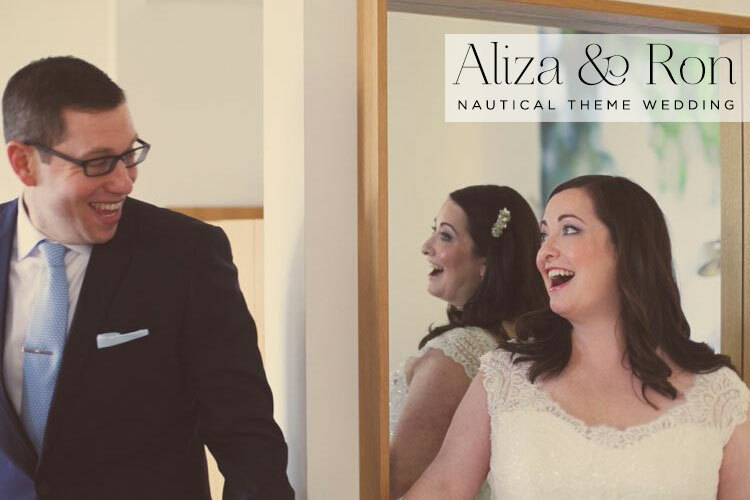 Alona Bell is a fantastic hair and makeup artist and she was recommended to me by our wedding planner, Yael Schachar Wagner. I wanted a natural look with a bit of drama, and she hit a home run. The groom was just as interested in what he was going to wear as the bride was! Navy suit by Hugo Boss, white french cuffed shirt by Thomas Pink with the groom’s initials embroidered on the cuff by Monogram Cottage in New York City, precious cufflinks that belonged to Ron’s father Shimon (z”l), tie by Vineyard Vines (from afar a pretty pattern, from up close, a bunch of whales! ), engraved sterling silver Brooks Brothers tie clip (a gift from the bride) and Oxfords by Allen Edmonds. Each bracha of the sheva brachot was said by significant people in our lives, from family members to friends. 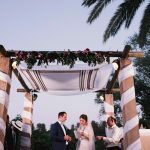 It is customary in Israeli weddings that the guests stand around the chuppah (instead of sitting in the audience, as is customary in American weddings). 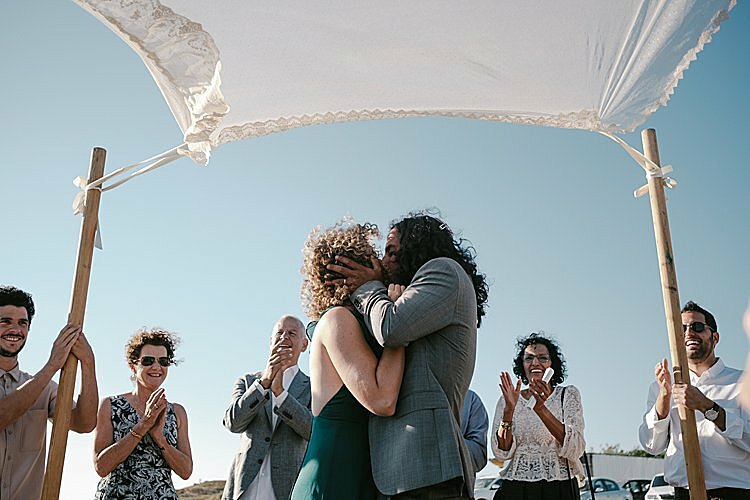 Carrying the israeli custom through to our Israeli-American wedding really made us feel like we were enveloped with love and support. We opted for a simple organza over 4 poles, each held by someone close to our hearts. We walked down to Arik Sinai’s Siba Tova. The lyrics really resonated with us. We also wanted a tune that would make people clap and feel the joy we were feeling that day. Our florist was Kim Bulow. 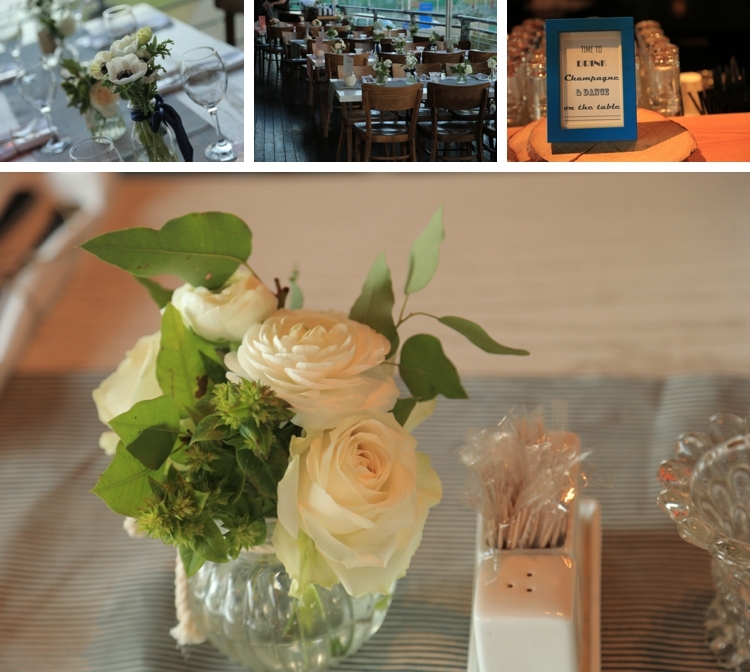 The blooms were arranged in small vase, bottle, jars and formed a “runner” down the centre of the table. 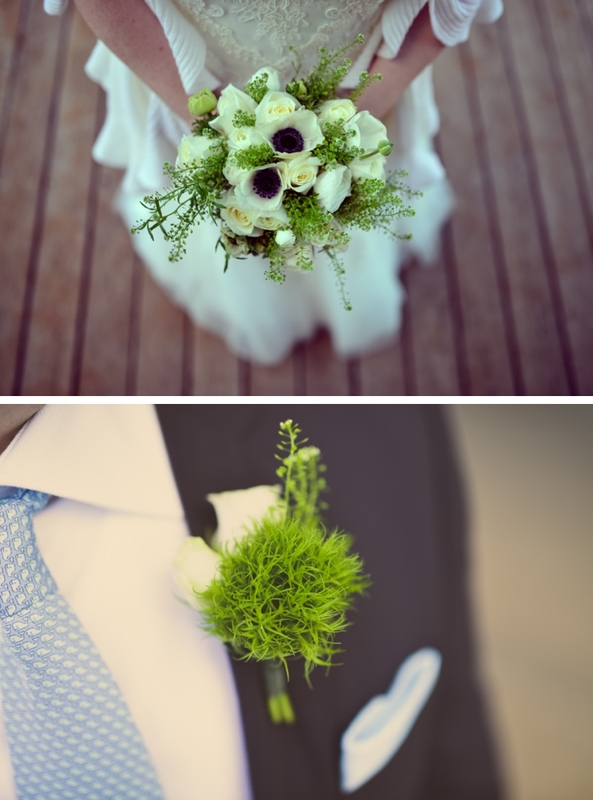 She used lisianthus, phlox, limonium, anemone, and ranunculus. We chose Mor Elnekave, who was recommended by my cousin. He has an amazing eye and shoots documentary style. He caught so many moments that day that still make us smile. 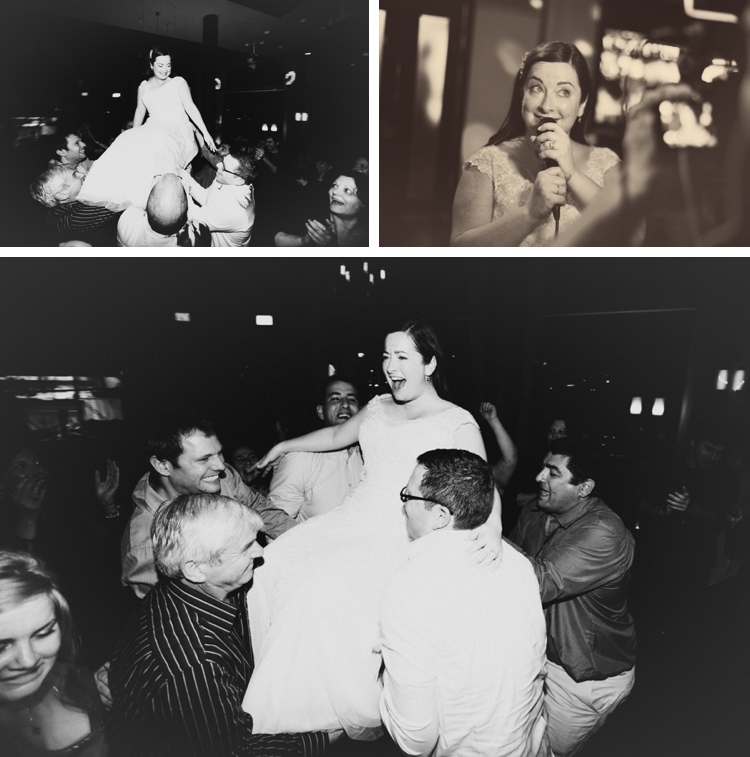 We opted for two photographers so that we could get as many moments captured as possible. After Ron picked me up from the Rothschild 71 Hotel to start our wedding day, we had our own “private” photo session while walking through the streets of Tel Aviv, as well as through the Hayarkon park. 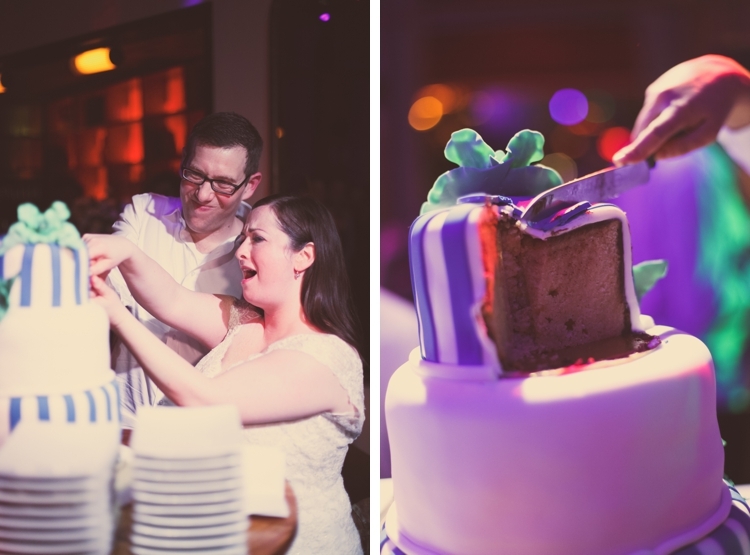 Noga Cakes made our beautiful three-tiered cake which was too good to be parev – but it was! 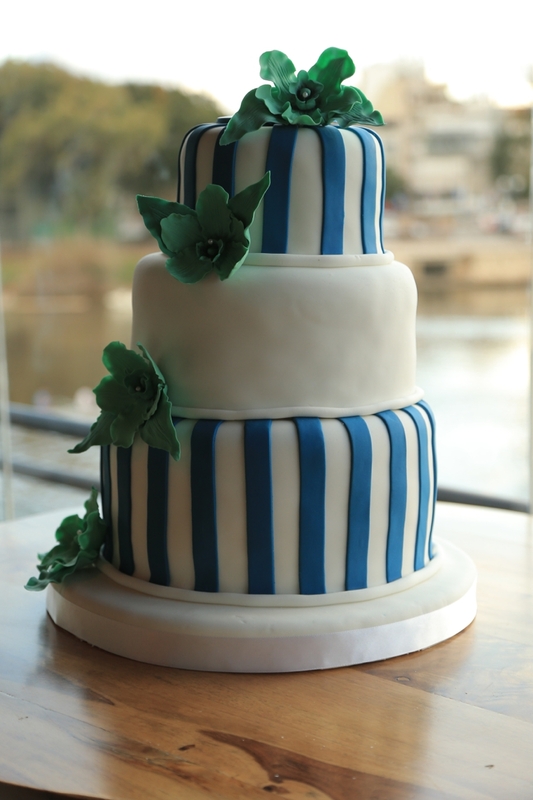 The bottom tier was chocolate, the middle vanilla, and the top marble. On the recommendation of friends, we picked Amit Koren as our DJ. He has infectious energy, is a real sweetheart, and great taste in music. 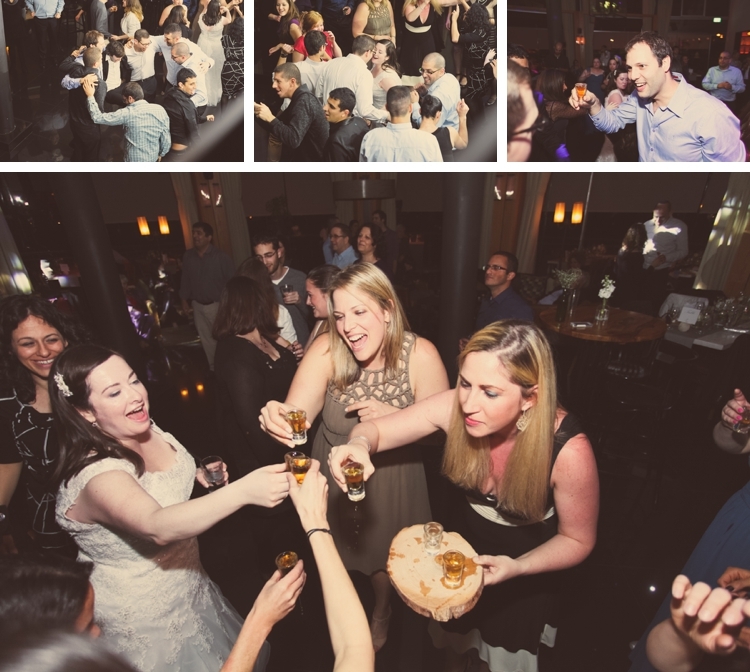 Both the Israelis and the Americans danced all night long. He was a huge hit. The day will fly by – take a moment every hour of that day to absorb the amazing things happening around you, and package the moments in your mind into little vignettes so that you can remember them in years to come. Appoint a friend to be your “hydrator” so that you don’t dry up while dancing the night away. And even as the bride, don’t forget to eat!